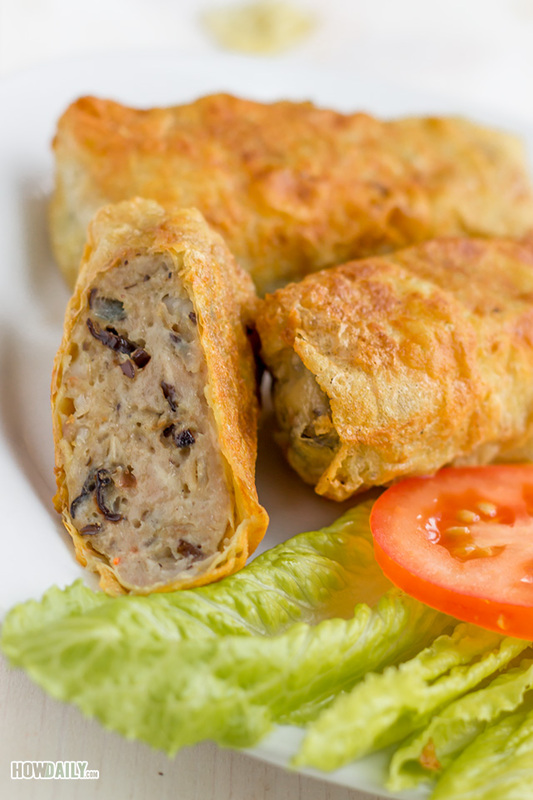 Introducing the tofu skin roll (bean curd roll), this is not a sushi roll, but rather an appetizer dish from the South East Asia. 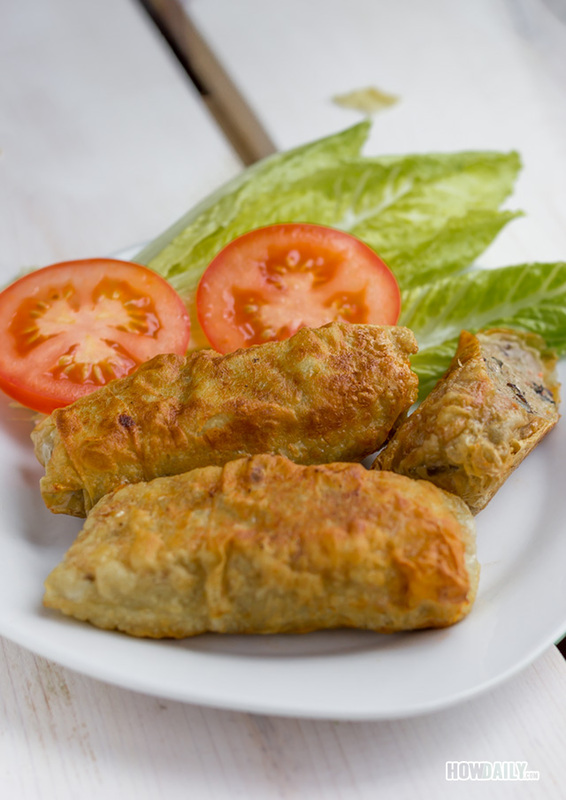 In Vietnam, there are several way to make tofu skin roll, but typically divide into three: full veggies filling, shrimp (or seafood like crab, fish, etc) filling, or just a combination with ground pork. 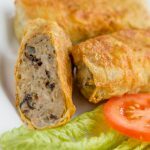 Overall, It’s a roll that wrapped with tofu skin or bean curd, filled with ground meat, shrimp and a variety of veggies and spice. The roll then, depend on its size, thickness and filling ingredients, will be steam, fry, braise, curry, etc. To add to the crunchiness, black fungus, water chestnut and carrot are usually mixed within. Onion, whole or powder is added to counter the pork smell. Ground pepper is a must, and sesame oil will enhance the flavor while prevent the filling from being too dry. The tapioca starch and whisked egg are there to bind them all for easier shaping. The rolls, when fry, can be served as is or dip it with some tamarind dipping sauce to bring out the whole tropical exotic experience. Soak black fungus in warm water for about 20 minutes or until soft. If you're using shitake, soak in warm water a little bit too to wash them. In your food processor, add 1/2 lb pork, 1/4 lb shrimp, 1 Tbsp tapioca/potato starch, 1/2 onion, 1/2 tsp salt, 1 Tbsp seasoning powder then start grinding them. Transfer, cover and store mixture in fridge for 30 minutes to an hour. Chop the remaining 1/4 lb shrimp. Chop water-chestnut into small chunks. Thinly slice black fungus/mushroom into long string. Separate egg yolk and white, save half egg yolk for roll hemming. Beat egg white till fluffy. In a mixable container, whipped egg white till fluffy. Add chilled ground meat/shrimp, chopped shrimp, 1 Tbsp onion powder, water chestnut, black fungus/mushroom, 1/2 egg yolk, 1/2 tsp ground pepper and 1 Tbsp sesame oil to egg white container, beat them good until fully mixed. Cut tofu skin leaves into roll-able size wrapper (about 5" x 5" ). Wet them by placing under running water for 10 seconds or dip into water container. Hang them vertically on rack to drip off excess water. 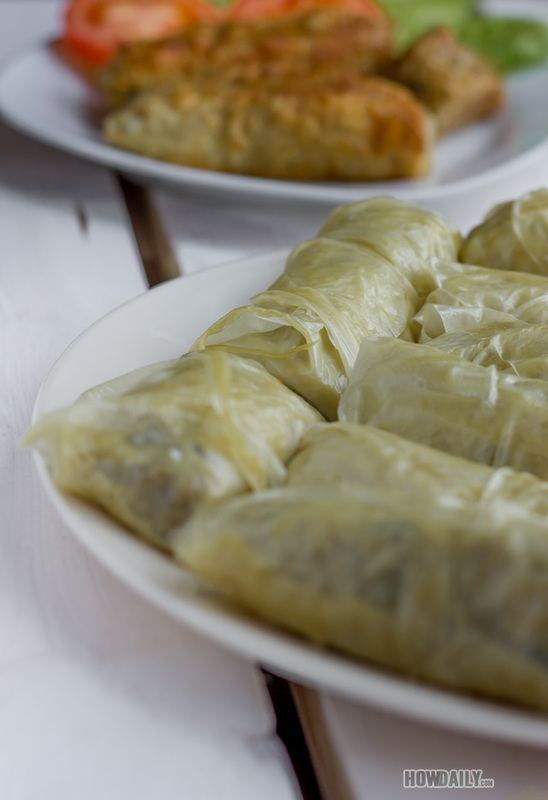 They'll be soft and ready to wrap in 2-3 minutes. Carefully place a tofu skin wrapper on a flat surface. Whoop a spoon or two of the paste mixture onto the wrapper, gently press to mold into round or rectangular roll shape. Wrap to cover all side, complete the seal with egg yolk as adhesive. Turn on your deep fryer or wok. Wait till oil is hot, reduce to medium heat then add all rolls in. Serve hot as is with garnishment. In a small sauce pan, mix 1 cup water with 1 Tbsp tapioca starch until dissolved. Mash the tamarind meat if it's too hard. On low/simmering heat, heat the water/starch solution, when hot, add tamarind. Keep stirring to prevent overflow. When all mixed, add 1/2 Tbsp sugar and 2 Tbsp fish sauce. Keep stirring until the sauce becomes thicker. Remove from heat, add crush garlic and sprinkle on some roasted sesame.